This year’s Junior Achievement Future’s Bowl was another success. Thank you to everyone who came out to support, volunteer or donate on behalf of Junior Achievement! Bowling for Junior Achievement at Lucky Strike Social in Crossgates Mall. Why JA? Last year, Junior Achievement reached more than 19,000 students in the Capital Region, educating them about work readiness, entrepreneurship, and financial literacy! Consider this: - JA Alumni have larger HS graduation rates and higher education completion rates than those of the general US population - 1 in 3 former JA students credit JA for providing them with an idea of what to pursue for a career as an adult - 88% of JA Alumni express career satisfaction. Click here to make a donation. The more money raised, the more JA classrooms Berkshire Hathaway HomeServices is able to sponsor in our community! 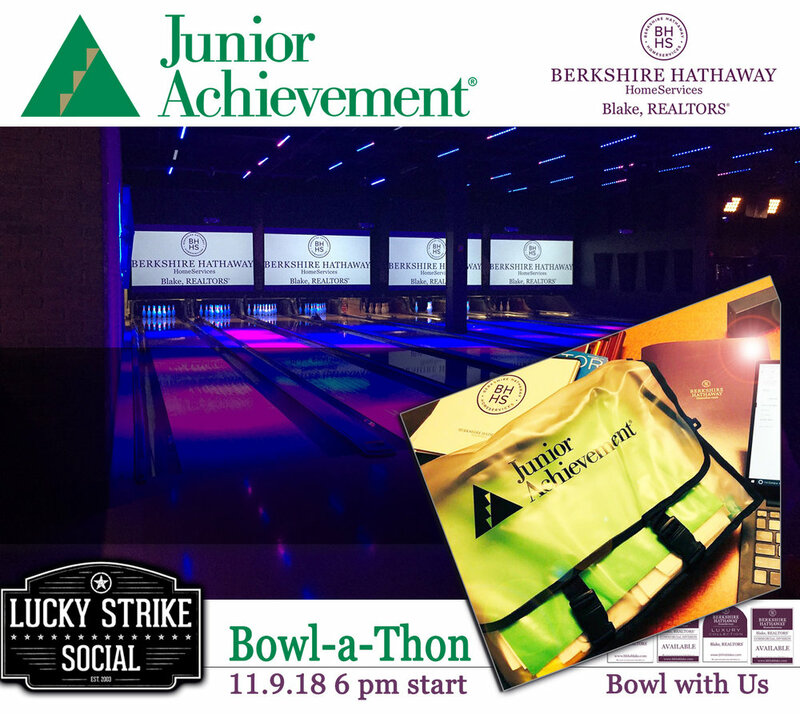 Great participation in our 2017 Junior Achievement Bowl-a-thon at Lucky Strike in Crossgates Mall over 3 weeks with 60 local companies participating to help empower the 25,000 students in the Capital Region on understanding the value of staying in school. Another great Future's Bowl for Junior Achievement of Northeastern New York. Bowl with us this November 9th at Lucky Strike in Crossgates Mall. Photos from 11.10.16 Bowl a Thon. Proud to have so many associates participate as teacher volunteers in the classroom Summer 2017. Partners in Achievement breakfast at Wolferts Roost Country Club. Board member and Commercial Division Richard Ferro and 2016 Berkshire Hathaway HomeServices Blake Realtor Galaxy Award Winner Fran Callahan. We proudly participated as a sponsor of the 2016 & 2017 Junior Achievement Bowlathon. Thank you to everyone who helped us fundraise for Junior Achievement and bowl in November 2016 & 2017 at to raise money. Our company raised nearly $10,000.00 (including sponsorship). If you have any questions about how you can help Junior Achievement or would like information on becoming a classroom volunteer please fill out the contact form here on the Junior Achievement of Northeastern NY website.